← Saxophone in the rain. Did they give them to you – or did you buy them? Is the Miltihno pre- or post- ‘Jazz in the Space Age’ (George Russell, 1960)? Have another beer- but hang on to your reals! Ha ha. What record shops do you know where they give you records? (Having said that Plano B did a buy 3 get one free in a spontaneous kinda way today). Anyway…the David Martin Stone cover has the charm of use and the Hendrix/Redding album is ok inside. 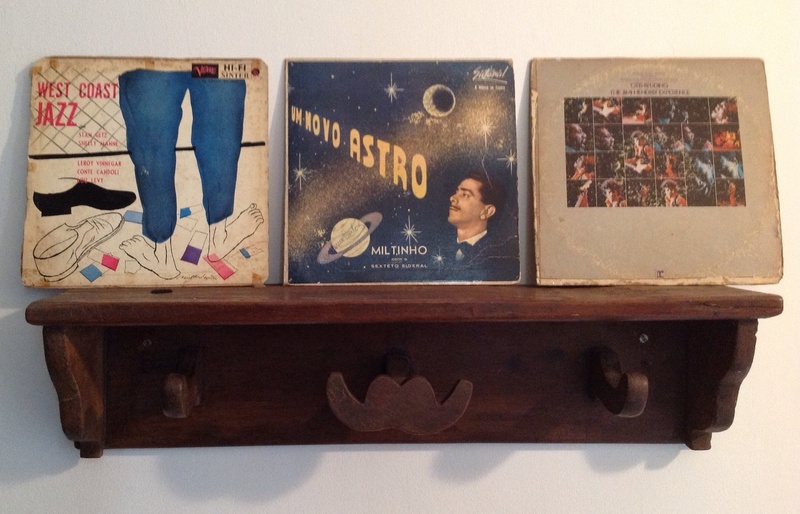 ‘Um Novo Astro’ seems to be exactly contemporaneous with the George Russell platter though with a little more samba I suspect…. George Russell and Miltihno exhibit album cover Zeitgeist, then – there’s a thesis waiting in the wings! ‘Charm of use’ is like old leather jackets with the ‘perfect worn in look’ (a descriptor I discovered when I was looking to see how people described their battered old jackets when thinking of disposing of mine), or ‘wear worn’. But it does look charming – it is one of my all time favourite DSM cover illustrations – and if it plays it is a cool album- how are ’60s Brazilian jazz pressings for Verve (original was on Norgran in the USA, as it was recorded in 1955, and Verve was founded in 1964)? Today is the 68th anniversary of its recording – Recorded at Radio Recorders, Hollywood, California on August 9, 15 & 19, 1955. Serene-dipity!